As the ball left Stephen Curry’s hands, I was certain the shot was good. The Golden State Warriors’ season had come down to this one history-shifting play, a long, somewhat frantic three-pointer with 33 seconds remaining in Game 7 of the NBA Finals. It was June 19, 2016, and over the past 236 days, the Warriors had played some of the most dominant basketball the world had ever witnessed. They started 24-0, then 36-2, 48-4, and 62-6. By season’s end, thanks to a four-game win streak heading into the playoffs, the Warriors had won 73 games against only nine losses, a mark no NBA team had pulled off in the league’s 67-year history. To cap off that milestone with a championship—which they’d done just a year earlier—seemed all but academic. And through a regular season in which the Warriors didn’t lose back-to-back games, Curry was the catalyst that kept the team humming. After winning the NBA’s Most Valuable Player Award for the 2014–15 season, Curry was even more spectacular in his encore performance. He served up a 40-point, seven-assist, six-rebound breakout on opening night against New Orleans. After a 53-point conflagration in the Warriors’ third game, Curry was the league’s top scorer every day through to the schedule’s final game. Curry was an offensive dynamo who could not be slowed for months; he not only broke his own NBA record of 286 three-pointers in a season but obliterated the mark, swishing 402 such shots during the season. Curry also led the league in both steals and free-throw percentage for the second straight season, while also finishing eighth in assists. For much of the year, his Player Efficiency Rating—an analytical measure of a player’s overall effectiveness—hovered above the all-time mark set by Wilt Chamberlain more than 50 years earlier. Alas, Curry’s PER merely ended up the eighth-best in NBA history. As his stats further pushed the boundaries of reason, Curry witnessed his star status grow into that of a full-fledged supernova. When the Warriors came out for warm-ups two hours before a home game at Oracle Arena, more than a thousand fans would congregate around the periphery of the court, often jostling for position and craning their necks for just the right angle to witness Curry’s 20-minute warm-up, often an entire show unto itself. His two-handed dribbling drills under the basket. His effortless threes from the center-court logo, often nailed in rapid succession. All capped off by the customary three-point attempt from the side tunnel that leads down to the Warriors’ locker room. It’s a 45-foot heave that he doesn’t always convert—Curry is only human, after all—but when the ball goes in, a crowd 90 minutes before any basketball game has never sounded more alive. As much as the fans in Oakland would eat up Curry’s pregame ritual, fans on the road could be just as insatiable. With every ensuing win and Curry highlight, the Warriors became a traveling road show, like an All-Star baseball team barnstorming the country back in the 1930s. During the playoffs, ESPN dedicated a camera feed strictly to showing Curry’s midcourt warm-up heaves so it could then push the video link to subscribers of its mobile app. With all this attention, all the accolades and superlatives, there was a sense this was all building to . . . something. The Warriors, both individually and as a group, had made so much history in such a compact time that the season seemed destined to culminate in a memorable finish of some kind—either resounding triumph or unfathomable horror. And it all came down to this shot from Curry, which looked on target as it angled toward the rim along its natural arc. Aside from a smattering of visiting fans here and there, most of the nearly 20,000 people inside Oracle Arena figured the shot would go through. You could excuse the assumption. They had been conditioned to believe this. Since Curry arrived in the Bay Area in the summer of 2009, he’d shown glimpses of becoming this kind of player, someone who could decide championships with an unforgettable game, a marvelous quarter—even a single, dead-aim shot from 25 feet out. The story of how the Golden State Warriors found themselves one shot away from NBA immortality is one of meager beginnings, like so many compelling stories, but the thing about the Warriors is just how fast all this success came about. Five years ago, they were deep in the midst of one of the most prolonged stretches of suckitude any NBA team had ever endured, permanent residents beneath the NBA’s subfloor. Entering the 2012–13 season, Golden State had made the playoffs once in the past 18 seasons. To put that in perspective, only one NBA team has ever suffered through a more sustained slump. From 1976–77 to 1990–91, the Los Angeles Clippers didn’t make the playoffs at all—15 straight years missing out on any chance for a title. Considering eight of 15 teams from the Western Conference make the postseason every April, the odds should be on a team’s side a bit more often than that, no matter how ineptly they play. Not so for the Warriors, who were owned by one of the most reviled men in all of the sport. From 1995 to 2010, fans in the Bay Area wished day and night for his removal from ownership. Once in a while, there’d be a rumor or a whisper about some potential deal that might be in the works, but it never seemed to materialize, and many Warriors fans couldn’t imagine when better days might be imminent. It seemed preposterous that this poorly run team with bottom-rung talent could possibly compete for anything worthwhile any time soon. That all started to change in the summer of 2010, when a new ownership group paid a record amount of money to buy the team and immediately began changing the culture. They assessed every employee’s place in the company but waited six months before implementing any sweeping changes. Any workers dissatisfied with their role were summarily shipped off to other competitors. Office space was renovated and rebuilt to improve workflow, communication, and trust. A greater emphasis was placed on finding technological solutions to lingering problems and using proprietary analytics to unearth latent advantages their employees already possessed. Sounds a lot like a tech company, right? That’s because Joe Lacob, Golden State’s new majority owner, happened to be one of Silicon Valley’s most experienced and successful venture capitalists. His co-owner, Peter Guber, was one of Hollywood’s most famous and prolific producers. Along with a team of tech-minded investors sprinkled across the Bay Area, they spent nearly a half-billion dollars just for the right to try to turn one of the most moribund, unimpressive franchises in all of professional sports into something successful. The first couple of years didn’t go so well. Two seasons in, two seasons still out of the playoffs. Fans remained agitated and impatient, but the new owners were committed to seeing their vision through. There were missteps, turns gone wrong that led to harsh lessons. But there were also glimpses of a brighter future, brought about by savvy evaluations, and the kinds of twists of fate that seem to come only when you’re in the absolute best position to accept them. Both men had found success outside sports through constant innovation; both were convinced they could apply that same principle to construct a championship-caliber team. They would urge employees to speak out; encourage cross-collaboration; invest in bold, new technologies that could flame out; and never resist the urge to adapt. In the tech industry, the term for this stage of development is “beta”—never fully baked, always in flux, focused yet open to change. That strategy? It worked beyond their wildest imagination. The Warriors captured their first championship in 40 years and followed that up with the greatest regular season in NBA history. Curry was a global megastar. The Warriors were raking in millions in pure profit, faster than any other franchise. And the winning seemed to come so easily, as if it was all preordained. Now, in the waning moments of Game 7, the Warriors teetered on the precipice of all-time greatness, one final three-pointer from a couple dozen feet out that would decide whether Golden State completed a scintillating storybook run or summoned forth a monstrous wave of second-guessing that few teams had ever experienced. As the tenths of a second ticked off, the oxygen sucked itself out of Oracle Arena, the ball fell toward the rim, and we all waited to see what the fates would decide. It was the culmination of a six-year odyssey to build the best basketball team ever assembled. But to really fathom what came next, we need to go back to how the Golden State Warriors, against all odds, arrived at this most improbable and momentous point in time. “Betaball chronicles the best NBA story of the last 20 years thoroughly, but with humor, grace and detail. The Warriors deserved a great book written about them. Now they have one." 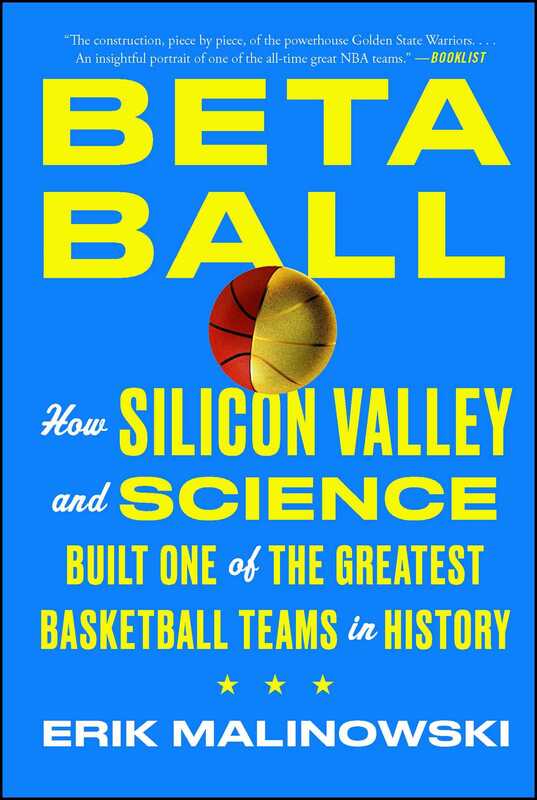 "Impressively researched and skillfully crafted, Betaball will open your eyes to all that it takes to build a winning culture." "As lively, thorough, and engaging as the team it chronicles." "Malinowski has laid out the construction, piece by piece, of the powerhouse Golden State Warriors...An insightful portrait of one of the all-time great NBA teams."